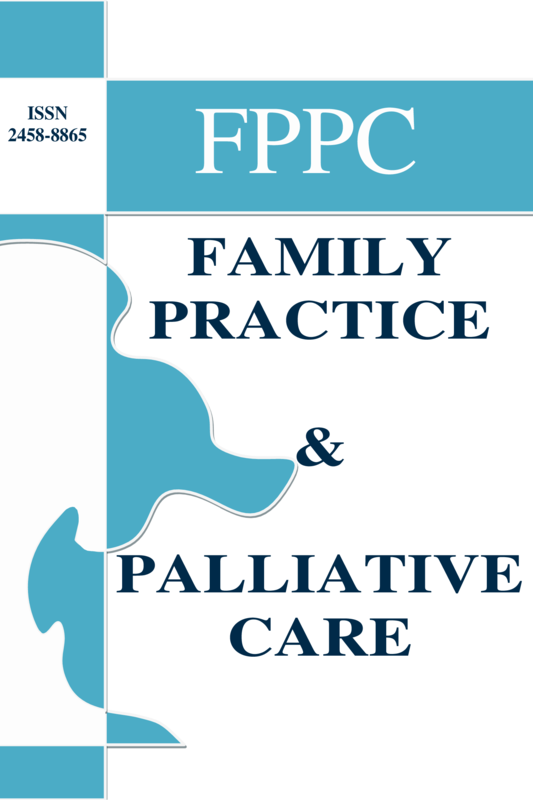 Family Practice and Palliative Care (FPPC) is a peer-reviewed, open-access, free of processing/submission charges, current periodical journal. Our journal is published three times annually. The language of publication is English (December 2018). Family Practice and Palliative Care (FPPC-Family Practice and Palliative Care) is an internationally indexed journal that evaluates the article in Turkish or English in any subject that can contribute to a Family Physician's multidisciplinary and biopsychosocial approach. Applications for all medical sciences (internal, surgical, basic, etc.) will be included in our journal if it is for this purpose. Palliative Care is one of the side branches of our discipline that we encourage to develop in our country by giving place in our journal is another goal. Our mission is to add value to scientific article with respectful-empathic communication, self-sacrificing and constructive editorial in loyalty to international scientific standards. Our vision is to contribute to scientific publishing, science and family practice. The scientific papers to be submitted to our journal should comply with the current recommendations of the World Health Editorial Board (ICMJE) and the standards of the Publication Ethics Committee (COPE). Submitted articles must be unpublished and not under review in any other setting. In case of plagiarism, COPE directives are followed. It is mandatory to upload the Copy Rights Transfer Form, ICMJE form and Ethics Committee files at the application stage. Retrospective studies are also included in this rule. Ethical committees' approval for experimental, clinical and drug research according to the ethical standards of the Helsinki Declaration and the informed consent of the participants should be taken and detailed in the Methods section of the article. In animal studies, it should be stated that the study was carried out in accordance with the principles of the Guidance on the Use and Care of Laboratory Animals and the ethics committee approval was obtained from the relevant institution. Research and publication ethics must be complied with in the articles to be submitted. The responsibility of the manuscripts belongs to the authors. The reviewer forms of the articles rejected by peer-review are notified to the responsible author. Open access to reviewer forms of articles can be provided. In the Pre-Control phase, all articles are subject to plagiarism and in compliance with writing rules. If plagiarism is identified, the COPE guidelines on plagiarism will be followed. Revision is required for compliance with writing rules. If it passes the pre-control phase, the manuscripts are evaluated by at least three peer-review. Minor and / or Major Revisions are issued with a Reject or Acceptance Decision. If your article is accepted for publishing, the data passes through editorial revisions that will increase clarity and intelligibility without being modified. The editorial and scientific content of the journal and full responsibility for the publication time of this content belong to the editorial office. It is mandatory for the researcher to keep the data of each research published for 5 years. According to the rules of our publication policy and the international publishing organizations we are involved in, we will be able to ask the authors of the data and analysis programs of some articles from time to time. Authors should declare that there is no conflict of interest and also, if there is any, the status for their financial support should be clear in the copyright transfer form and at the end of the article. The authors should indicate their contributions to the manuscript in the copyright transfer form, and declare at least three contributions in order to have authorship rights. FPPC has adopted the “open access policy” by considering the principle increasing the global exchange of the knowledge that generates useful results for humanity. FPPC is an "open access" journal the content of which is available to all users freely. Users can read the articles in full text, download, print out and link to articles citing the journal without taking permission from the publisher or the author(s). Family Practice and Palliative Care is licensed under a Creative Commons Attribution-NonCommercial-NoDerivs 2.0 UK: England & Wales (CC BY-NC-ND 2.0 UK) at http://www.sherpa.ac.uk/romeo/issn/2458-8865/. A pdf version of the articles published in the journal may be used in accordance with the SHERPA / RoMEO policy (See the full details of the license). not alter, transform, or build upon the content. Advertisements new to the FPPC require approvement. Neither advertisers nor their agents may collect any personal information from any user viewing the FPPC Web site except with the user’s knowledge and permission and only after giving the user substantive information about the uses to which the information will be put. Similarly, cookies, applets and other such files are prohibited if those files transmit any personally identifiable information to the advertisers or agencies without the user’s knowledge and permission. The full rules for any market research or promotion associated with an advertisement must be displayed in the ad or available via a prominent link.